A scaffolding cable had become loose while two men were working. The FDNY had to break through a window to bring them to safety. 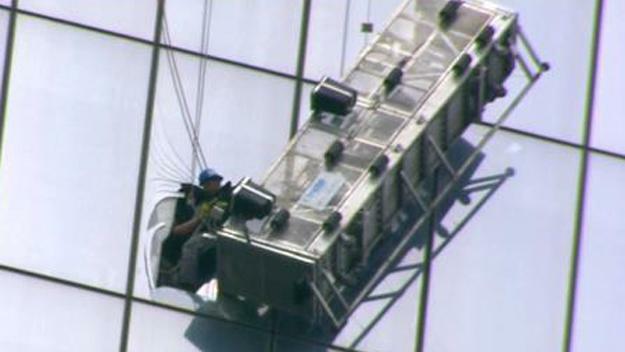 Two window cleaners were stranded on the exterior of the recently opened World Trade Center for around 90 minutes Wednesday after one of their scaffold’s cables became loose. The New York Police Department told BuzzFeed News that the pair began hanging between the 67th and 68th floors of the 104-story skyscraper at around 12:42 p.m. EST. The stranded workers, Juan Lizama and Juan Lopez, have been washing windows for 14 and five years respectively, said Rachel Cohen, a spokesperson for local chapter 32BJ of the Service Employees International Union, which represents window cleaners. Cohen said the men are employed by a contractor, Upgrade, to clean the building, which is the tallest in the U.S.
NYFD Commissioner Daniel Nigro told reporters that one of the scaffold's cables developed slack on the west side, lowering the scaffold from a horizontal to a vertical position. The pair was rescued around 2.20 p.m. ET by NYPD and FDNY emergency workers, who broke through windows to reach the men. 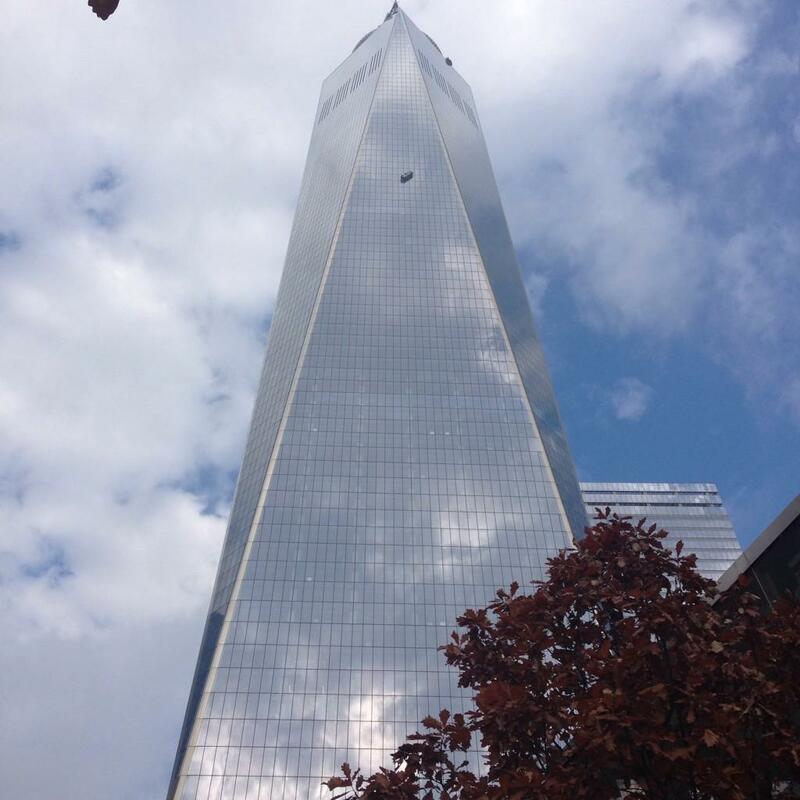 The rescue operation involved lowering a rope from the roof of the 104-story building to secure the men, Nigro said. A radio was also lowered so that rescue workers could communicate with the stranded men. "They reported to us they were ok and they felt secure," said FDNY Rescue Batallion Chief Joe Jardin. "We just reassured them that we were working deliberately and in a positive direction to gain access to them," Jardin said. Three layers of glass had to be cut, some with diamond saws, in order to reach the pair. The men were transferred to hospital, suffering from mild hypothermia. "We're overjoyed and incredibly relieved that they are safe and sound," Cohen said. "We're glad that they have the safety protocols so that it's all ended well and that these men will be going home to their families tonight." Remarkably, the Port Authority Police Department, which oversees security at the World Trade Center, had trained for this kind of emergency just 10 days ago. The plaza around the World Trade Center, including the 911 memorial and museum, was cleared during the rescue operation. "Safety is obviously the paramount issue here," Cohen said. "It has long been important that companies maintain the highest standards of safety. This is especially important for window cleaners." 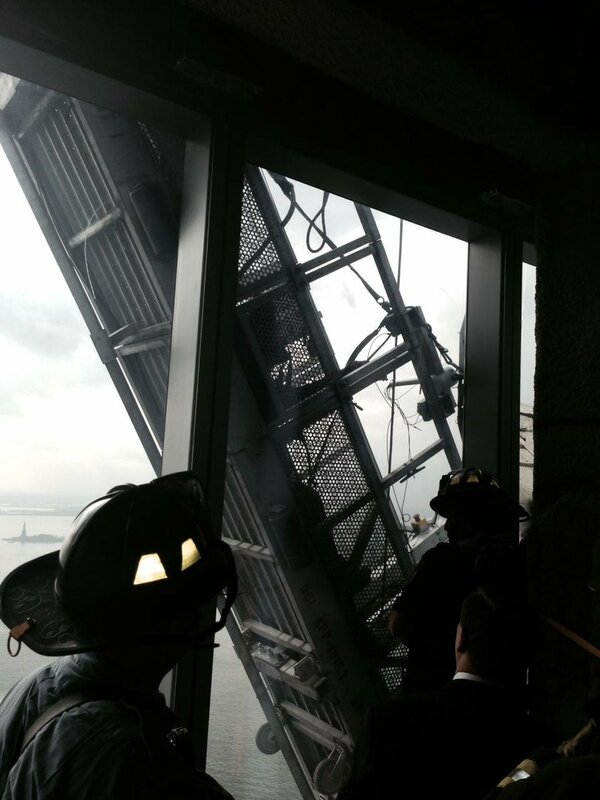 Now: #FDNY rescuing workers trapped on scaffolding outside 1 World Trade Center. View from the 68th floor. A previous version of this article relayed information that the scaffold's cables had snapped. The FDNY now says this information was wrong, and that the cable only developed slack. This version has been updated to reflect this information.